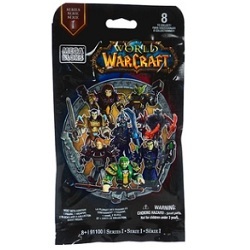 Product Detail Summary: From Mega Bloks World of Warcraft, add to your armies with the highly collectable Micro Action Figure Hero Packs Series 1. Each Hero Pack contains a fully armed and armoured micro-action figure ready to engage the enemy. With 8 Warcraft heroes to collect, part of the adventure is finding out which hero has joined The Alliance or The Horde! From common to legendary micro-action figures, a surprise Warcraft character is found in every Hero Pack.